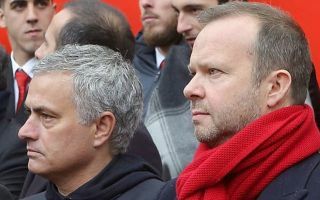 Jose Mourinho has already lost a large number of Manchester United fans, but now it seems he may be losing the media and the faith of his boss, Ed Woodward. Holt appeared to be hinting that it could be time for Mourinho’s metaphorical marriage with Woodward to be terminated. United chief executive Woodward appointed Mourinho in May 2016 and this is his third season – his infamous third season. Mourinho has a history of struggling in his third year in a job. Both of his sackings at Chelsea came in year No 3, as did his dismissal at Real Madrid. Holt was not the only journalist to have a pop at Mourinho on Sunday. Woodward finally beginning to realise he made a mistake by appointing Mourinho. That’s why he didn’t back him in the transfer window. Sad to see United being so badly mismanaged. Wonder what Mourinho has got up his sleeve to divert attention away from that performance. Sir Alex always told his team that if they matched the opposition for determination and desire then their ability would win the game. This team can’t do the first bit. It was awful, but please there is not a better manager available out there.